We have been working on our house ever since we moved in, May of 2014. I’ve showed you pictures of our Texas room, and breakfast nook. 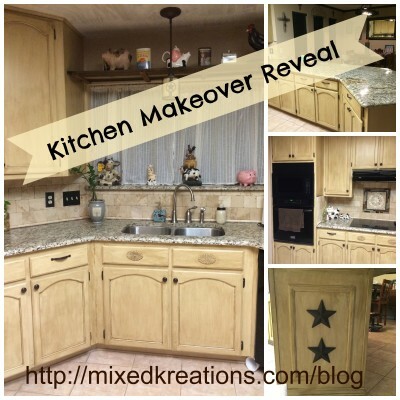 Today I want to show you the kitchen makeover, that has been long in coming . I thought that we were never going to get it done. But here we are finally! Replacing the tile floor in the kitchen and breakfast nook will come later on down the road. The above picture is before anything was done. 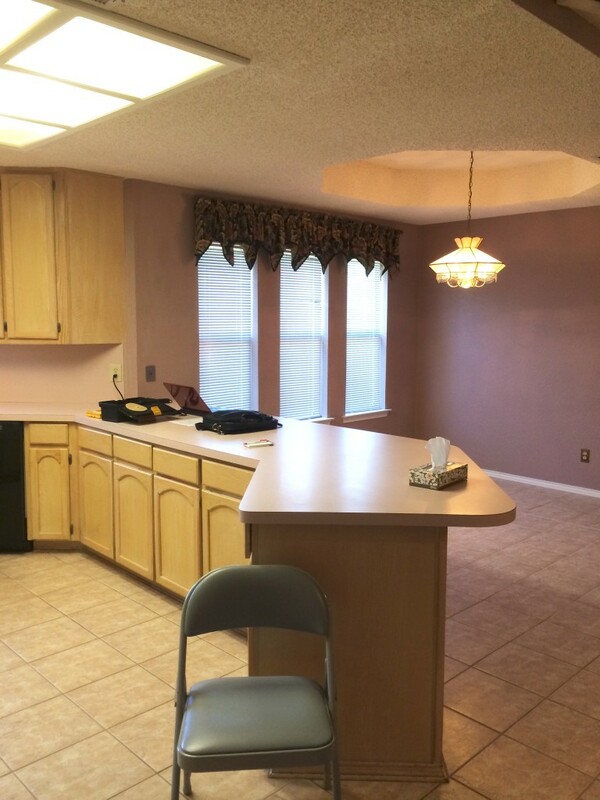 Notices the mauve walls, and if the picture was better you would be able to see that the kitchen counter is pink formica, and the cabinets are just varnished wood with no stain or color to them. Yuck!!! 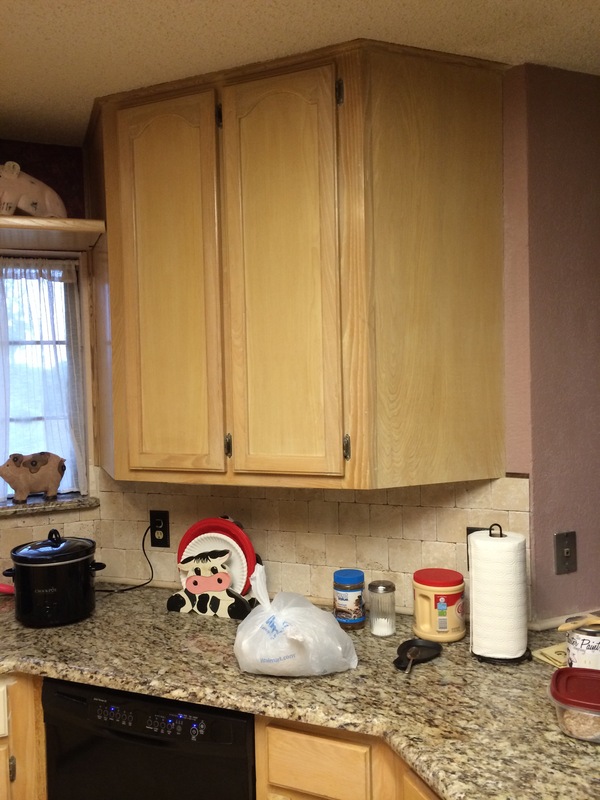 This above picture is after we had the granite counters put in, and the hubby did the backsplash. Much better, but still have the ugly cabinets. Notice the medallion in the backsplash, the hubby did that. I think he did a awesome job! First we had to remove all the doors and hubby sanded them while I used a liquid sandpaper on the rest of the cabinets. 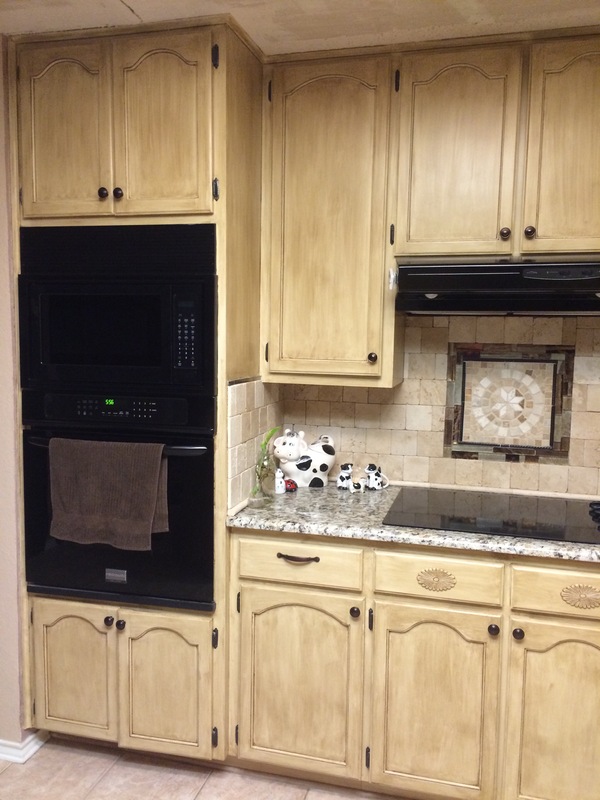 Then we painted the cabinets an antique white, and used an antiquing glaze over that. 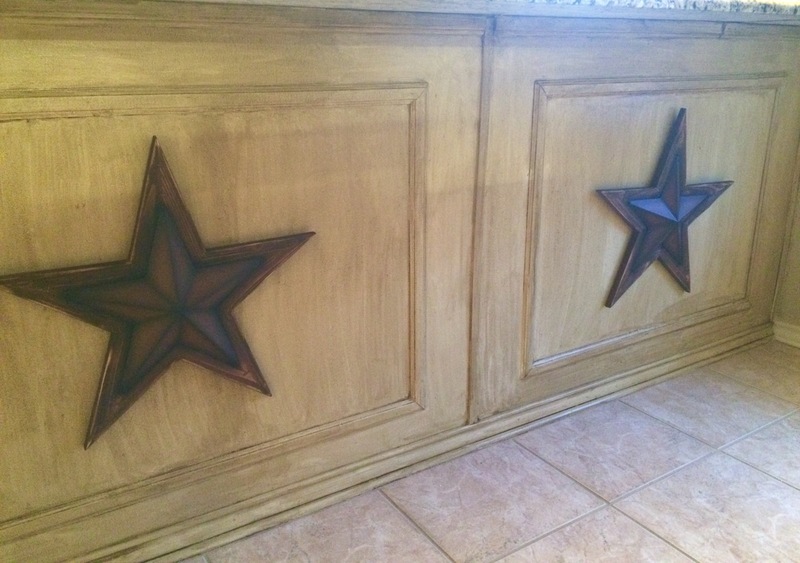 We added wood medallion’s to the faux drawers under the stove and sink. 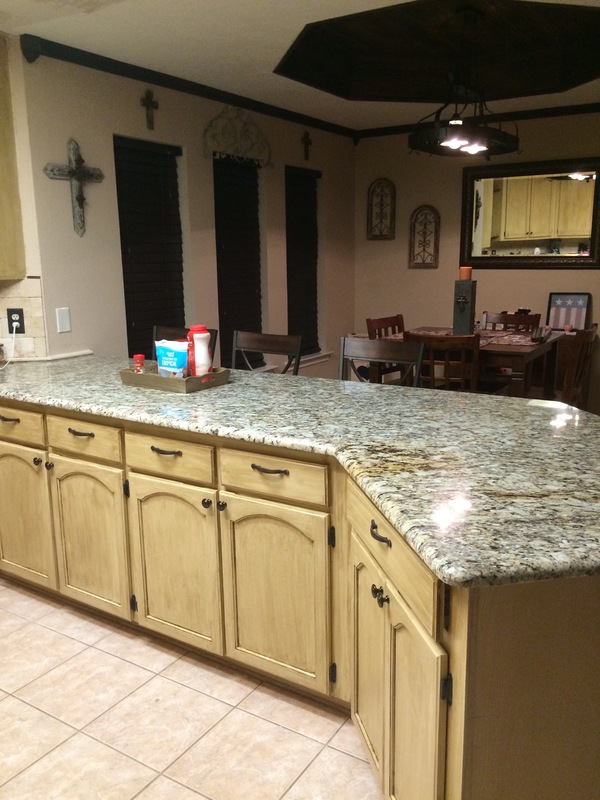 With the granite installation we received a new stainless steel sink, and had a new faucet put in. We replaced all the hardware. 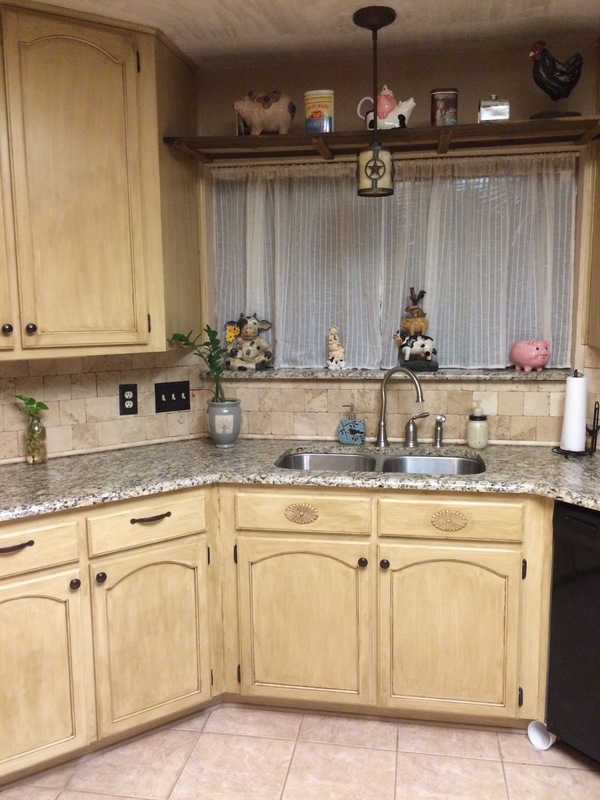 Notice in this picture that the side and back of the breakfast bar has some trim added then what the before picture up above had. The before was just plain panel. 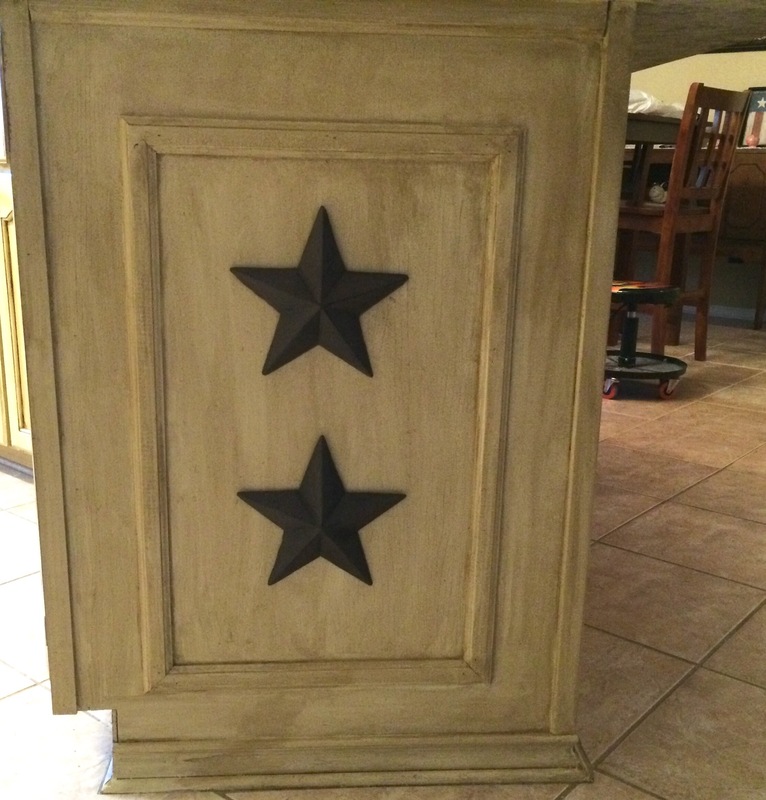 The hubby added the stars to tie it in with the Texas room. 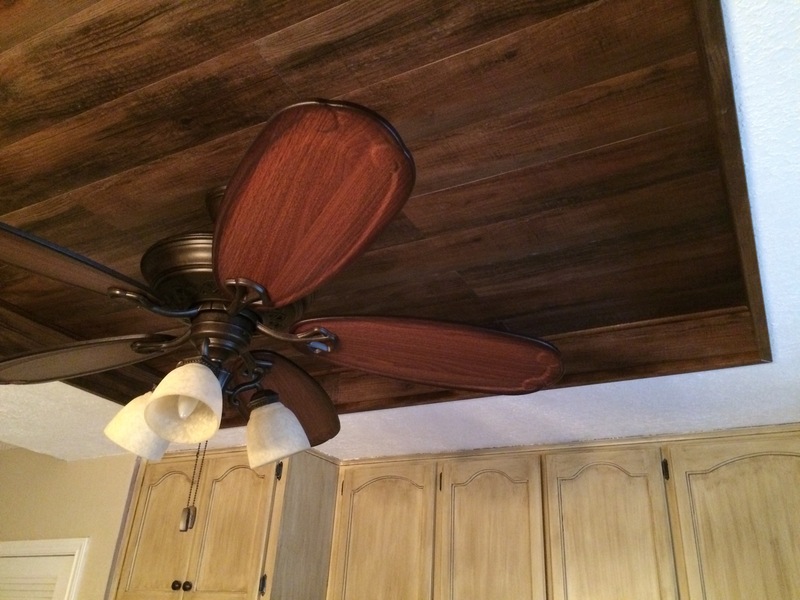 The hubby removed all the popcorn ceiling and added a texture, and where in recess ceiling was he added faux wood that matches the foors we had replaced throughout the house (except where the tile in the kitchen and breakfast nook is, which we will replace at a later date). 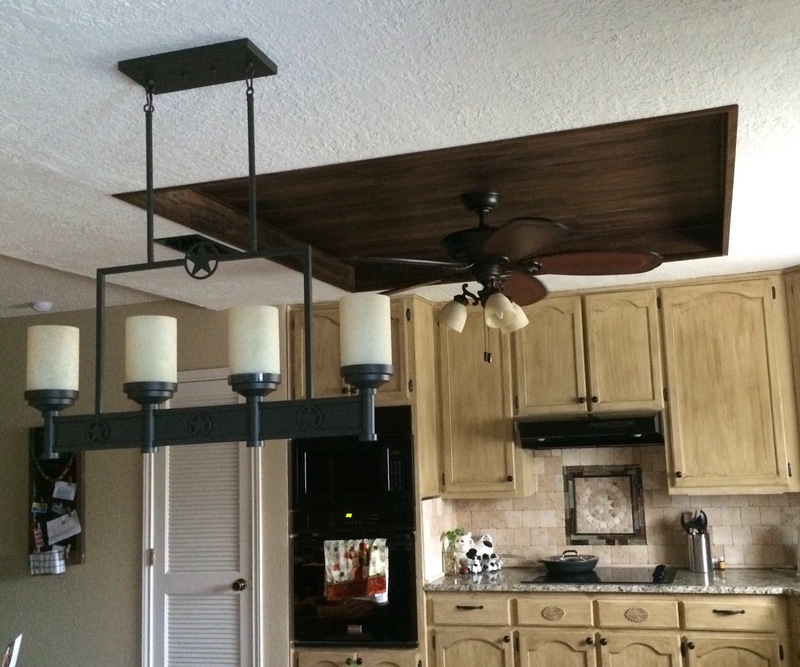 Hubby put in new lights and a ceiling fan for me (-; He’s so sweet! That’s it for this kitchen makeover, now on to the work on our sunroom door, then the master bath. Linda that is one major transformation. 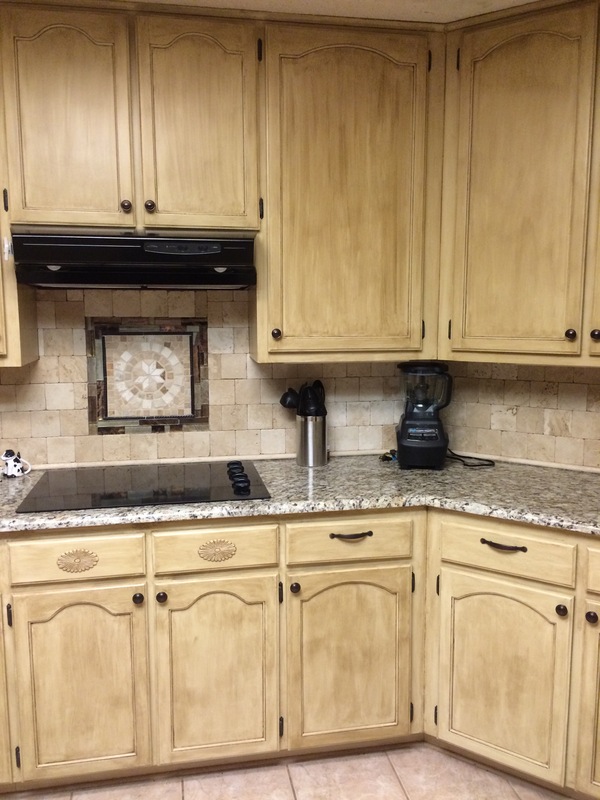 Your kitchen cabinets look fantastic. I can’t believe you painted them white and then glazed them. Tha must have been some huge job. 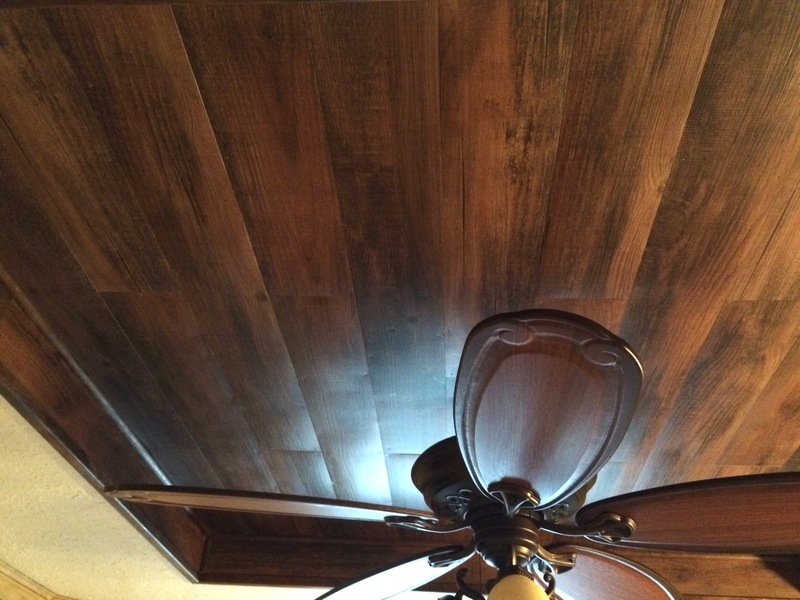 The room is full of lots of little details that make it so special such as the stars and the ceiling fan with the wood. Thank you Mary! It was a lot of work, and it took over a year because we just don’t have a lot of time, and We would also get burned out and take a while to get started again. But it’s finally done, Yay! Thank you Cathy! It was a long time coming, but so glad it’s finished. What a beautiful make over Linda! 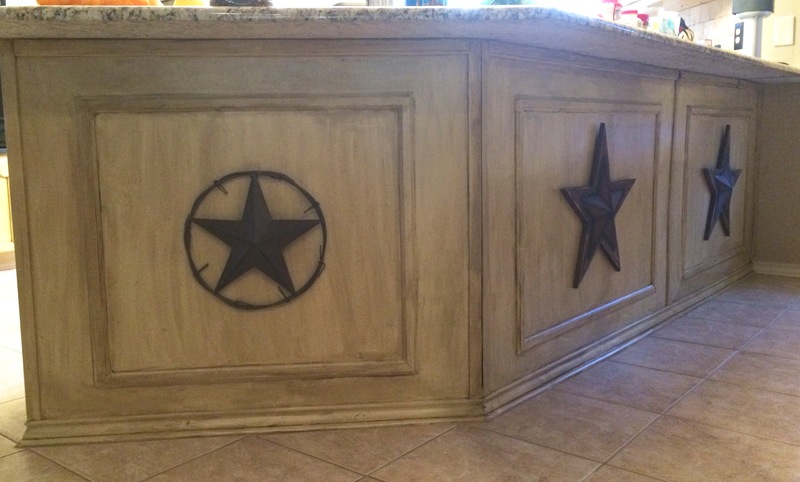 I absolutely love the backsplash and then the stain you used for the cabinets is awesome, it makes it look rustic along with all those little details everywhere!! Thank you Katrin! 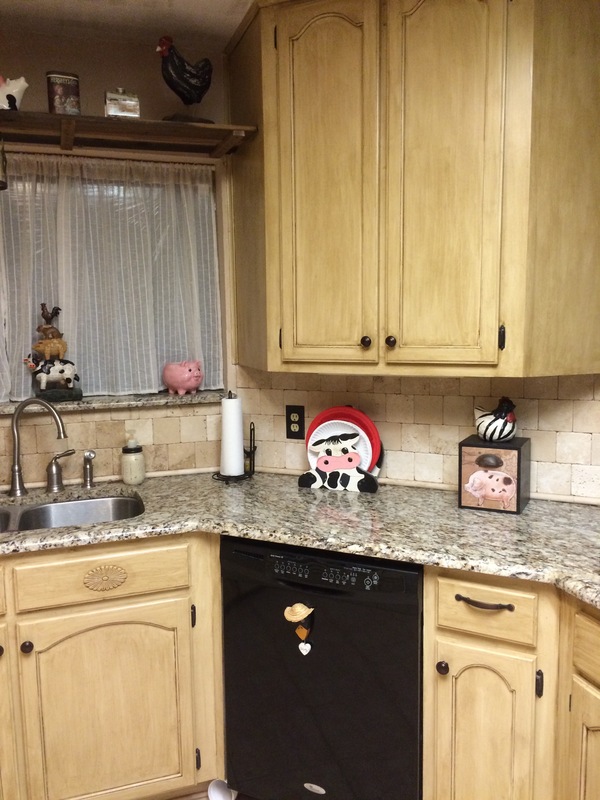 The hubby did a great job on the backsplash, I am so happy we are done, and very happy how it turned out.